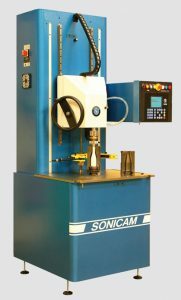 The Sonicam Mould Gauging Machine was designed for quick, easy and accurate measuring of the container mould volumes. The machine can detect volumetric variances of 0.01 ml. The use of this machine enables the glassmaker to avoid the manufacture of out of specification containers. Accordingly the machine can assist in increasing the usage time of glass mould sets if used consequently. Siemens components and Siemens controls ensure that the system is maintained user-friendly.